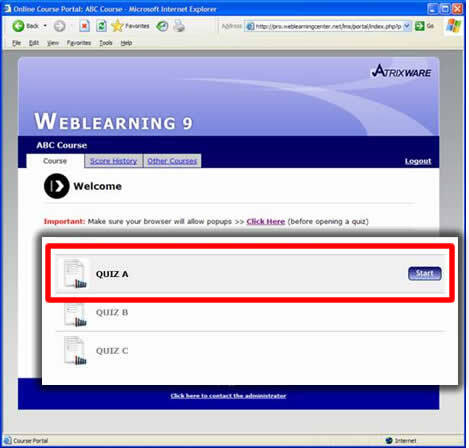 The Weblearning Online Quiz System enables you to create courses that contain quizzes that must be taken in a specific order. 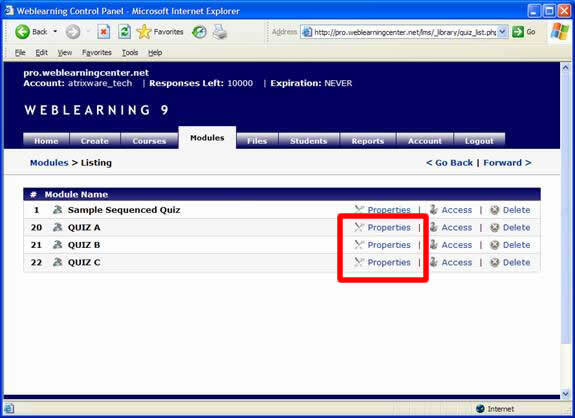 By default, when you create a course, that functionality is turned ‘off’ (meaning quizzes you place into a course can be taken in any order). However, you may have a requirement that students can only take ‘QUIZ B” after they have taken “QUIZ A”. 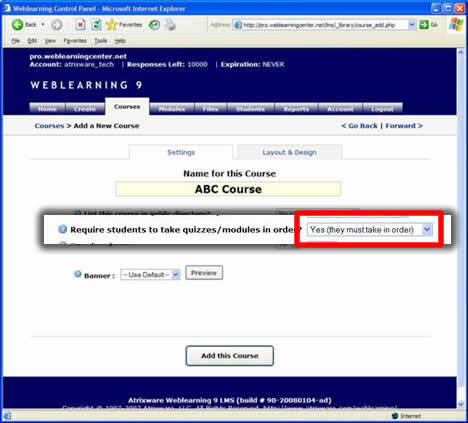 The Weblearning System enables you to perform some fairly sophisticated logic, and covering all of the scenarios could make for an extremely long article, so for this example, I will show you how to place three quizzes into a course, and set up the course so that the student will have to PASS each quiz before taking the next one. Fisrt you will need to place quizzes into numbered ‘slots’. You may have come across this when you published your quizzes in the past, and just ignored it (as you should have if you aren’t concerned about the order in which student take the quizzes). Since we are now concerned with this, the slot number is very important - as it defines the order in which the quizzes are ranked. For example, a quiz in slot #5 is ranked higher than one in slot #10. Therefore, if you have 3 quizzes in your course, the ‘order’ in which they must be taken are based on these slot numbers. Understanding that, during the publishing of your quizzes, you will need to plan a bit how to order them. You may not necessarily be creating the quizzes in the same order as you want them delivered, for example. As shown here, we are going to place each quiz into specific slots. I have “Quiz A”, Quiz B’ and “Quiz C”, and have placed them into slots 20, 21, and 22. Highlight each of the three quizzes one at a time (QUIZ A, QUIZ B and QUIZ C) and click the ADD button to add them to the course. 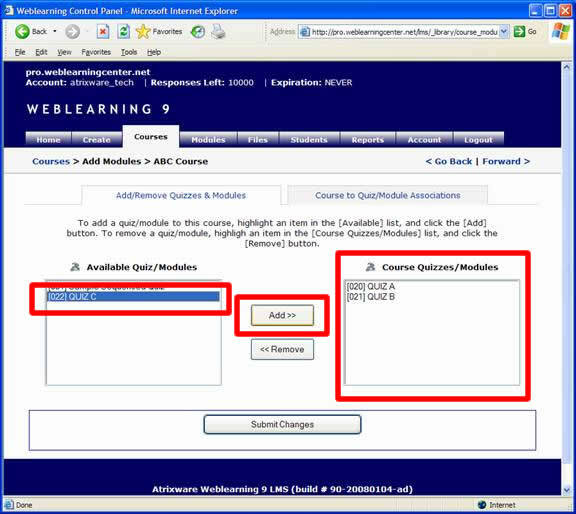 Note that the order that they appear in the list is the order they will appear in the course – this is a good verification of whether your quizzes will be appearing in the order you expect. The slot # is represented in square brackets next to each quiz title as well. Make sure you click the SUBMIT CHANGES button. Make sure that the Allow Retake on Pass is set to NO, and Allow Retake on Fail is set to YES. This must be done for all three quizzes. Submit the changes, and you are done. See my example below — I have added myself as a student, and then logged into the course. As you can see, the first quiz is ready to be accessed, but the other two are not yet accessible. 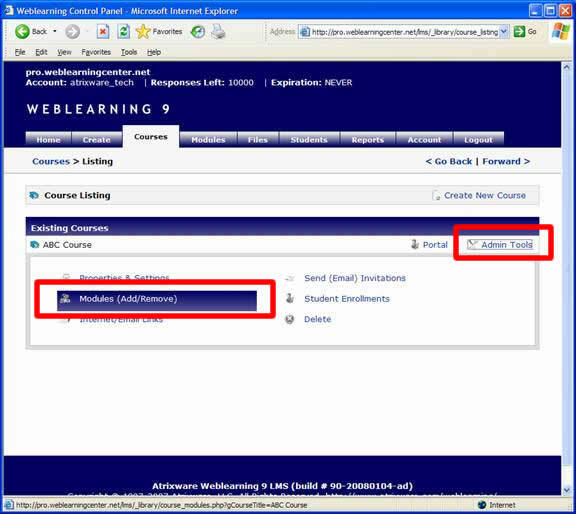 This entry was posted on Tuesday, February 12th, 2008 at 4:53 pm	and is filed under Anthony, Atrixware 101, Weblearning. Both comments and pings are currently closed.